Cast your minds back to mid-2017, the first HEIDENHAIN milling control to be made available with a touch-screen was the TNC 620 mid-range CNC system, launched in the UK. It will be on show for the first time at MACH 2018 along with a similar, next-generation version of the top-end TNC 640 control, hitherto unannounced. On the latter control, multi touch-screen operation is made possible through use of its main computer and the colour flat-panel display. Using touch gestures on the screen, similar to those used on smart phones and tablets, the operator navigates quickly and intuitively through long lists, programs and tables by kinetic scrolling. A short, slow swipe scrolls the screen over a few lines, while a long, fast swipe scrolls it over many lines. The user can stop dynamic scrolling at any time with a short tap, making it easy to find, for example, an NC block or a tool in a long program or tool table. 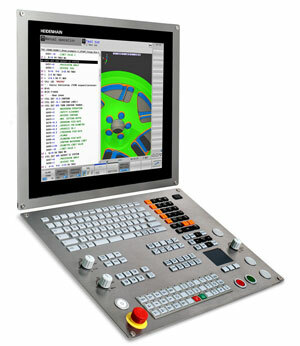 The user conveniently moves and rotates 3D graphics and zooms in or out by touch gestures, dynamically and smoothly. Soft keys are now operated directly on the screen, without the need for hardware keys. They are not needed either for soft key row switchover and operating mode selection, the respective soft keys remaining stationary while the others are scrolled. The TNC 640 is HEIDENHAIN's latest, high-performance milling control and in addition offers optional control of turning functions on a machining centre. It uses plain language programming and has an optimised interface that gives users unrivalled insight into system operation. The system's selectable, split screen mode shows part-program blocks in one half and graphics or status display in the other. A smartSelect function presents users with dialogue guidance for selecting functions quickly and easily, rather than using soft key format. Program creation with graphical support while another program is running is provided, and management of a tool changer and a pallet changer is available.